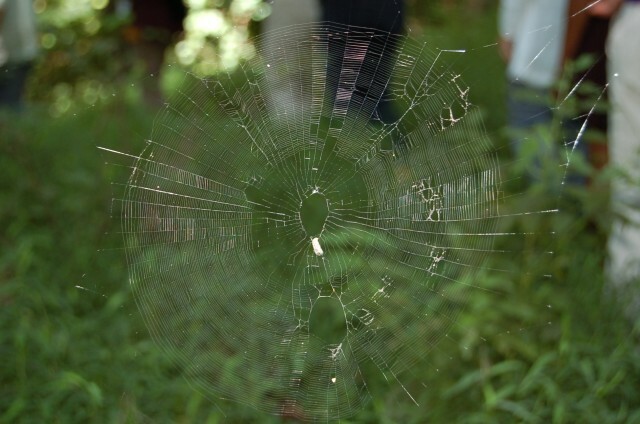 On May 31, 2013 The Schuylkill Center for Environmental Education presented Beyond the Surface: Environmental Art in Action – A conference of ideas and innovative thinking about the relationships between art and nature. This unique, first time conference brought over 100 professionals from the region and beyond (as far as Maine and North Carolina) to hear from the Advisory Team about their own individual practices, and then to join them in conversations. Below are each team members’ presentations, for those of you who wish to hear from them directly. The afternoon sessions were titled “Activate,” Integrate” and “Engage.” Undoubtedly, this one-day conference has sparked ideas and ways forward to attendees from the cultural and environmental communities. We look forward to continuing the conversations. Below, are each advisory team member’s morning presentations. Each were asked to speak on the work they do, have done, and speak to the issues pertaining to ecological art. on how she became an ecological artist, focusing on water. on things that changed his life: Andy Goldsworthy, Deborah Small, Art as part of a system. on a new kind of art, her own work, and the importance of collaboration and approaches, how artists make nature more visible. on participation, interruption and interaction in her work. Watch her have the audience reflect on their first encounters with nature. 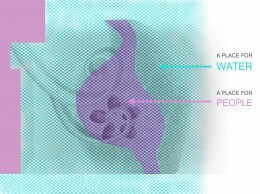 See her nine concepts about her practice. on her work in sustainability, her practice: personal, pedagogical and professional. This conference was made possible by the generous support of the Pew Center for Arts And Heritage Philadelphia Exhibitions Initiative and The National Endowment for the Arts. We are very excited to announce our new residency program, The LandLab Program. 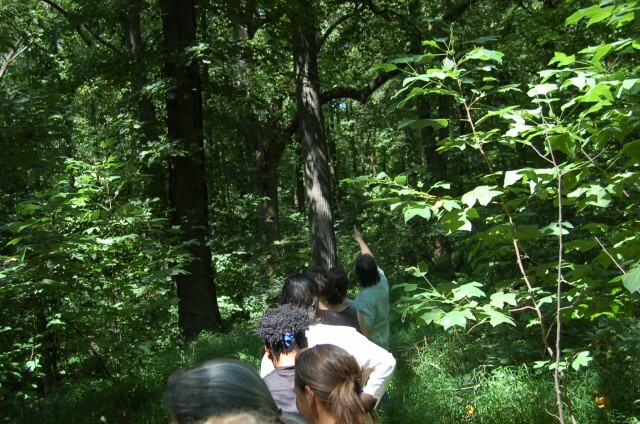 As a collaboration between The Schuylkill Center for Environmental Education (SCEE) and The Center for Emerging Visual Artists (CFEVA), The Landlab program invites professional artists to create projects which operate on the multiple platforms of artistic creation, ecological restoration and education. 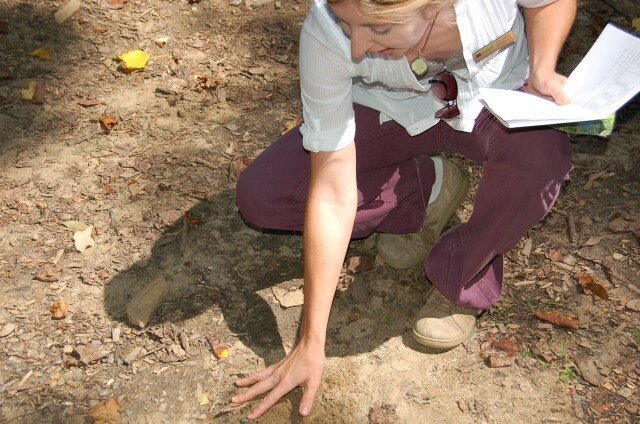 Specifically, four paid residencies of $3,000 each, taking place from April – October 2014, will grant selected artists resources and space on SCEE’s 340-acre property to engage audiences in the processes of ecological stewardship through scientific investigation and artistic creation. Our residency provides large outdoor spaces and limited indoor workspace, but does not provide living spaces. Artists will be expected to provide their own housing. Having a vehicle is recommended. LandLab projects will result in innovative, art-based installations that prevent or remediate environmental damage conditions while raising public awareness about our local ecology. LandLab seeks artists engaged in environmental exploration and discovery, who work well collaboratively across disciplines, have a working understanding and/or awareness of the ecology of Eastern Pennsylvania region, and are committed to deepening public awareness of environmental issues through their artistic practice. LandLab projects will prioritize time spent on site and a process of investigation. 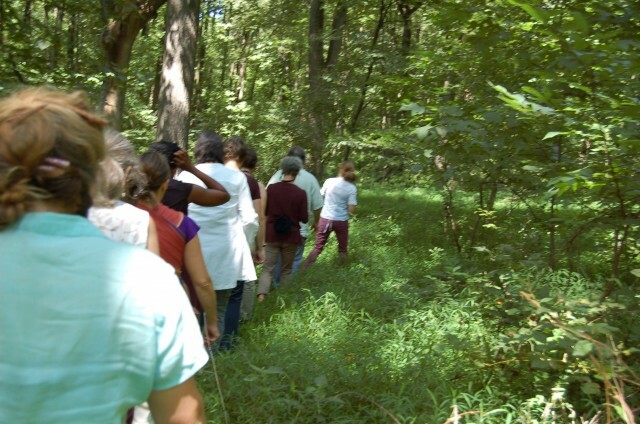 The Schuylkill Center creates connections between people and nature by using our forests and fields as a living laboratory. The Center for Emerging Visual Artists provides career development services for professional visual artists, helps artists reach their audiences, and promotes interest in and understanding of the visual arts among citizens of the Philadelphia region. Together and through this first program of its kind in Philadelphia, we invite all professional visual artists who fit these criteria and are able to work on-site at SCEE for the summer of 2014 to apply before October 15, 2013. Below is the information about our upcoming conference, a large part of this planning project. Online registration is available here! Join us for a day of ideas and innovative thinking, investigating relationships between art and nature. How can environmental art engage the environment and the individual, activate awareness, and integrate perspectives that result in unexpected and innovative approaches to environmental literacy? While the natural world has captured the imagination of artists for centuries, more and more of today’s artists are thinking beyond the studio, blending art, science and social practice with a fresh sense of immediacy, connecting art to nature and environmental issues. No longer content with scratching the surface of environmental problems, these artists want to move beyond the surface, engaging audiences to become part of the solution. 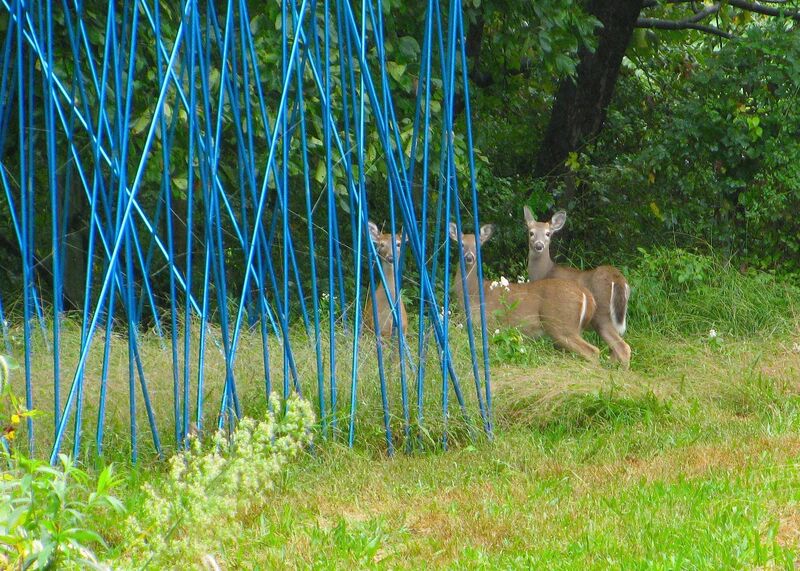 This conference brings a team of cutting-edge environmental artists and arts professionals to Philadelphia to share this work with you, to discuss ways art can create environmental awareness while restoring ecological systems. The artists presenting at the conference have been working with these ideas for much of their careers. 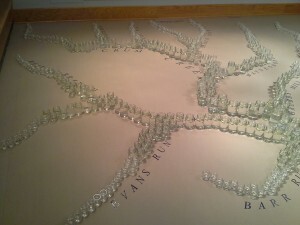 To call attention to climate change, for example, Eve Mosher painted a high-water line across Manhattan, showing people where the water would rise to if sea-level projections occur. 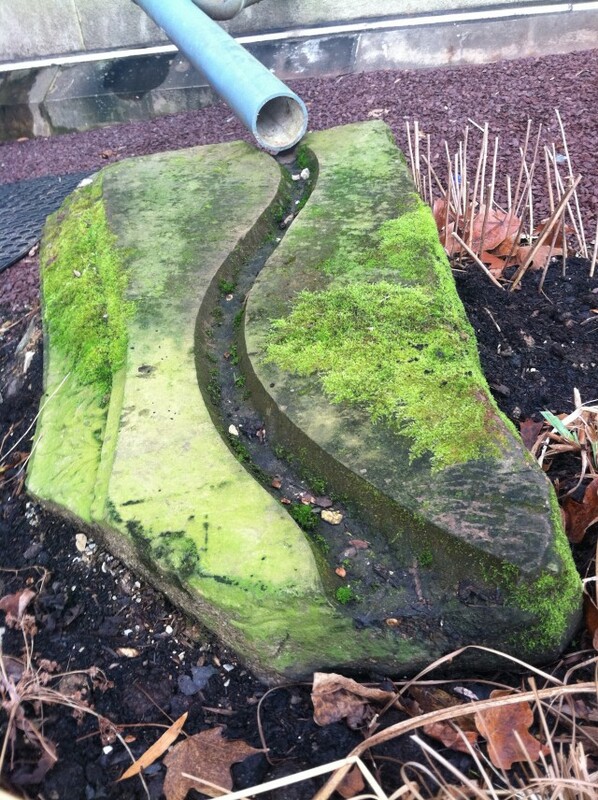 Stacy Levy’s artwork in the Schuylkill Center’s Sensory Garden remediates our building’s stormwater, which had been compromising our own forest. Lillian Ball projected a shifting, multicolored map of the Arctic circle onto a sphere of ice, the ice melting even as the projected image showed a vanishing Arctic. The Schuylkill Center’s Art Department has brought artists to its 340 acre site since 2001. This year, the Center has gone further, examining how art intersects with other disciplines –education, ecology, architecture, engineering and planning, to name a few, to create fresh innovations and exciting experiences for the public. 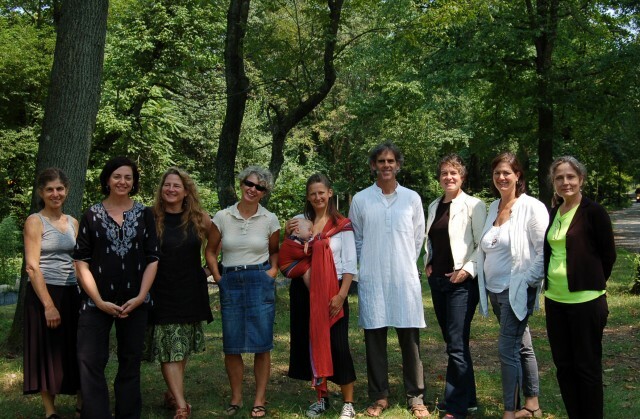 Our project has brought together an Advisory Team of the artists and curators who work in the field of environmental art. (Please visit www.schuylkillcenter.org/art for more information about this project, the team and to read their blogs). We believe art can help to repair a broken relationship between humans and nature and simultaneously transform audiences from passive observers of art to active participants in ecosystems. We are re-thinking how art exists at nature centers, and are eager to share these findings with our colleagues in the art and environmental communities. We welcome artists, educators, environmentalists, scientists, designers, landscape architects, teachers and students of all ages to this groundbreaking event. Levy discusses rainwater, and creating a permanent ecovention at SCEE. Celebrate Levy’s new installation with refreshments in the Sensory Garden. This even is funded in part by the Pew Center for Arts and Heritage and The National Endowment of the Arts. 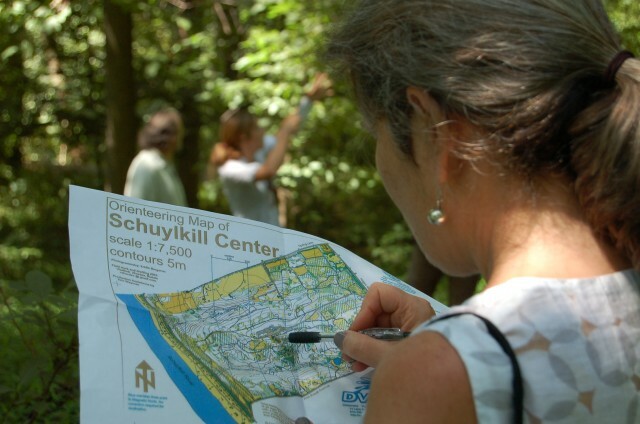 The Schuylkill Center for Environmental Education is working to investigate the intersection of nature and the city. 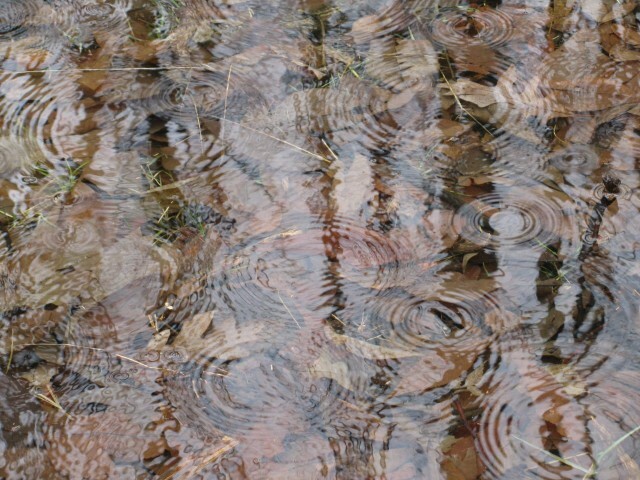 The role of rain in the landscape is being actively explored in programs and planning around its buildings. As a nature center, SCEE is at the forefront of solving site issues through art based intervention. 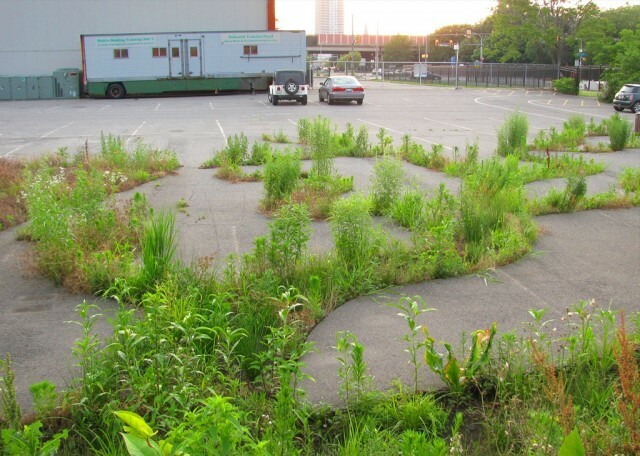 On May 31, 2013 a conference on New Environmental Art will be held at SCEE to look at ways that art and science can collaborate to solve ecological problems in urban nature, and enlighten citizens to find new solutions in their own lives. Rain is usually given a long narrow space to inhabit: gutters, downspouts, underground pipes. People can walk practically anywhere in a building and on the surrounding landscape. What if this paradigm got turned on its head? Give people a more narrow path of movement around a site while rain gets plenty of space to spread out and linger? How would our built environments change? And how would it change our relationship to rain?As an eco-artist, I want art to be an advocate of rain. Art is good at giving meaning to the leftover or abandoned aspects of the world—and rain is one of those abandoned elements. Though a yardstick worth of rain falls every yearin this region, we hardly register rain’s presence. In urban settings, architecture and engineering have generally kept rain invisible to us. The relationship between rain and the built environment needs to be changed, and art is well positioned to alter that relationship.At SCEE, I am working with ecologists, engineers and educators to create an artwork that gives the rain room to spread out while keeping people in a defined space. But people do not lose out in this design— both rain and visitors get a dynamic space to co-exist.Rain Gardens create spaces that can get wet and stay wet while the water infiltrates into the soil. Instead of becoming a muddy soup, the rain garden holds the rain within the permeable soil and the roots of a diverse community of native plants . 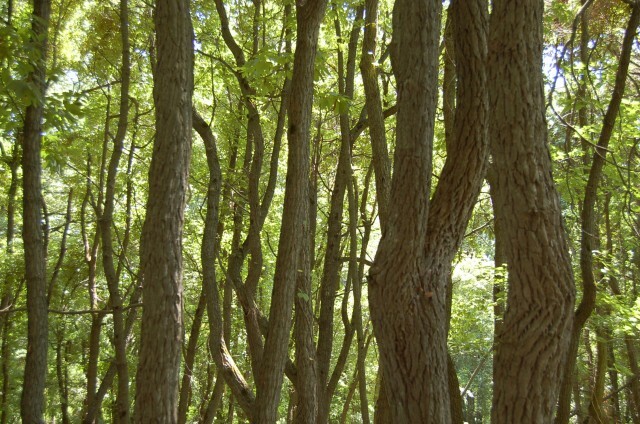 These plants also make good habitat for other species like insects and food for birds and other small mammals. This new artwork deals with two types of visitors to the site: rain and humans. A grated metal catwalk prevents the plants from being trampled while also keeping people’s feet dry. ‘Staying dry’ and ‘soaking in’ are two incongruent activities—one of the reasons that rain has no place to go in the built world is the hierarchy of the dry human foot! 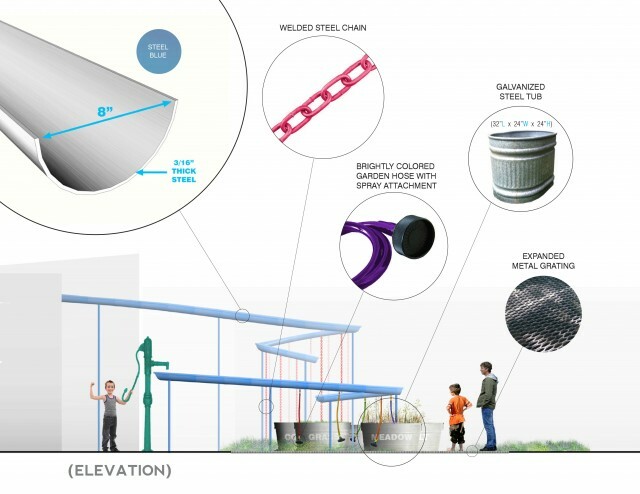 We want to demonstrate ways to change rain’s journey in the built environment. We also want to give visitors a chance to test out the very materials of the city: the surfaces we spend our lives walking on like asphalt, concrete and grass. How do these materials work with or work against rain? 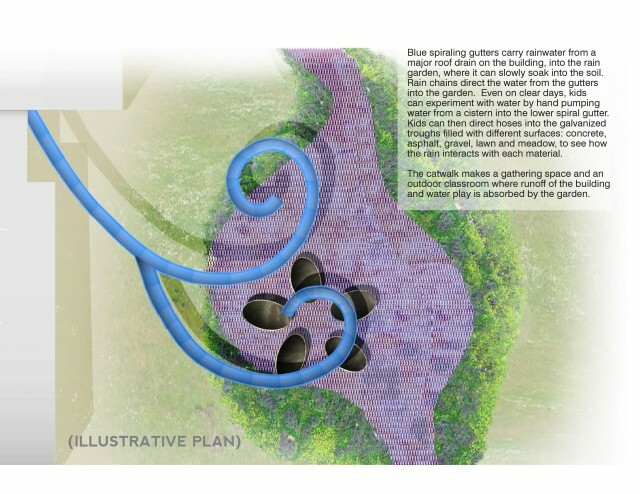 How this art works: Some of the rainwater will be diverted and stored in an above ground cistern. Then during dry days, our visitors can pump this contained water into 5 different troughs. Each trough contains a different familiar surface materials from the landscape: concrete, asphalt, gravel lawn and meadow. People can direct the rainwater onto these different surfaces to see how the water responds— by soaking in or running off. 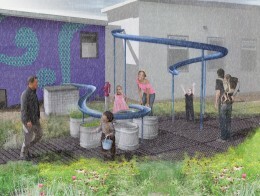 At SCEE rainwater will be given both the time and the place to act the way rain should act. And people will be given a place to interact with the falling rain while staying out of its way as it soaks into the soil. The idea of rain needing a refuge is a new idea to most of us. 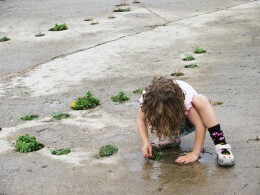 We hope people learn about rain, and the surfaces it meets in our world. 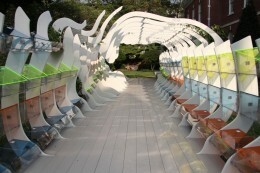 This piece gives people a new angle on rain and its relationship to our built environment. The piece will be under construction over the early spring. Please come by and see it! 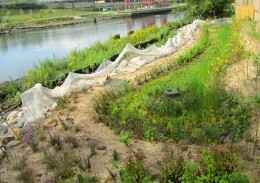 Want to know more about Rain Gardens?